Heimdal PRO keeps you safe from 2nd generation malware. 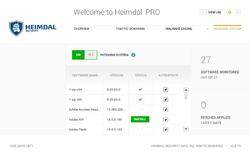 Heimdal Pro 2.2.0 was available as a giveaway on May 13, 2016! 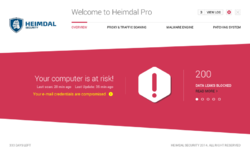 Heimdal PRO is a cyber security suite developed to protect against ransomware, financial malware, and other advanced threats that antivirus can’t block. With its powerful traffic filtering engine, its advanced malware engine and its automatic and silent software updating engine, Heimdal PRO keeps users safe from the latest cyber threats. 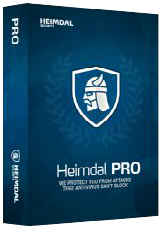 Heimdal looks at internet traffic, whereas antivirus looks at local files, which is why Heimdal PRO makes the perfect addition to any antivirus product, and is compatible with all antivirus solutions. Backed by a strong intelligence database, which is constantly updated with information about the newest threats, Heimdal PRO provides the proactive security layer that is necessary to fight the most sophisticated cyber threats and attacks. Keep your data safe from cybercriminals, conduct financial transactions with peace of mind and keep your system up-to-date with Heimdal PRO! Please note: The software includes a 6-months license and comes with free technical support and updates. How would you improve Heimdal Pro 2.2.0? I appreciate all the programs GOTD has brought for us over the years. But back then they brought full programs and no expiry date unless we uninstalled them. Now 70 percent of the programs come with a time they expire such as 6 months or a year. I would think programs like this that are so far embedded into your computer to protect you which might I add does a great job as I use to have this program but had a computer crash and lost my program would cause many problems once it expires or you uninstall it. Maybe not I don't know but 6 moths goes by pretty fast unless your sitting in jail doing the 6 moths that it hardly makes it worth while to install. When I saw this program being given away in my email I was quite excites as like I said does a great job but when I got here and saw once again on a giveaway that it was only for 6 months I was like really?? 6 months ! No thanks GOTD I'll pass on this one as this isn't just a small program that can be uninstalled without having to worry about any changes or things it stopped to all of a sudden start or leave a ton of corrupt files behind . I appreciate all the programs GOTD has brought for us over the years. But back then they brought full programs and no expiry date unless we uninstalled them. Now 70 percent of the programs come with a time they expire such as 6 months or a year. I would think programs like this that are so far embedded into your computer to protect you which might I add does a great job as I use to have this program but had a computer crash and lost my program would cause many problems once it expires or you uninstall it. Maybe not I don't know but 6 moths goes by pretty fast unless your sitting in jail doing the 6 moths that it hardly makes it worth while to install. When I saw this program being given away in my email I was quite excites as like I said does a great job but when I got here and saw once again on a giveaway that it was only for 6 months I was like really?? 6 months ! No thanks GOTD I'll pass on this one as this isn't just a small program that can be uninstalled without having to worry about any changes or things it stopped to all of a sudden start or leave a ton of corrupt files behind . Initially the website was busy but did get code without too much hassle. Installed easily and then did its initial scan which took quite a while but it was 'silent' and in the background so not intrusive or slowing my system. Updated the software that I asked/allowed it to, and installed a couple, again with my permission. It sits quietly in the icon area on the right of the lower tool-bar doing its thing. I tried to access a number of public domain sites during a search for some graphics. Most were fine but it blocked two telling me that they were a known risk. All-in-all I am quite impressed with this so far, I will continue to use it and, if it is as good as it so far seems, may well buy the licence in 6 months time. Installed on Windows 10 64 bit. Initially the website was busy but did get code without too much hassle. Installed easily and then did its initial scan which took quite a while but it was 'silent' and in the background so not intrusive or slowing my system. Updated the software that I asked/allowed it to, and installed a couple, again with my permission. It sits quietly in the icon area on the right of the lower tool-bar doing its thing. I tried to access a number of public domain sites during a search for some graphics. Most were fine but it blocked two telling me that they were a known risk. All-in-all I am quite impressed with this so far, I will continue to use it and, if it is as good as it so far seems, may well buy the licence in 6 months time. hello, can you use your product with another malware program? james, it is working alongside Norton 360 on my machine quite happily. I can't even get to the download? And it IS NOT in my SPAM Folder! What is this? This is the second download it 6 days that didn't work right! I installed, and see the program listed in the systray when I open it to customize, but nowhere else. I don't even see the icon in systray, only in the customize list, although there I set it to show both the icon and notifications. I searched through programs, and did a system search, but it's not showing up anywhere else, so I can't open it. I'm going to try it. I wouldn't have done it had i read about the company. It's located in Copenhagen and i generally trust Danish managers. But with only 4 years of operational history and with no ''media sensation'', i'm curious. If i won't see much ''interesting'' thing, i will uninstall it. Hope it won't leave much nasty traces! why should I use this instead comodo firewall that is free? on a quick look around the vendors site I cannot find an option to buy a 6 month license for any price, therefore we are not being provided with a "FREE licensed software you’d have to buy otherwise." as we cannot buy a 6 month license "otherwise". Go to the link provided in the read me file. But it's only a 6 mo lic for free, then $44 a year. I did have some trouble to get a license. After several attempts there was the code. The Setup did install Microsoft .NET Framework 4.6.1 Full Profile; nice but this software did restart Windows. Not nice. I did install this version of Framework self and after the restart I did install the software of today. With a code the Pro version was activated. And of course I did something illegal: I did a search for Win10 Activated. Then there was of course a site with spam, malware, etc. Fixed it thanks to the Heimdal Security Support! Doc, Malwarebytes pro for 24.95 a month? It's $24.95 annually. I had to download .NET framework first. Now, I'm at the part in the install where it's asking to enter my license key. How do I get this so I can continue? In the zip file you get from GOTD there's the installer and also a Readme text file. Please follow the steps there. PJ Johnson, In the zip file you get from GOTD there's the installer and also a Readme text file. Please follow the steps there. Andrei from Heimdal Security, Thanks -- I got it handled. Many people are not aware such programs exist, & I've rarely seen them mentioned outside of support docs, but I've always thought that knowing they could easily remove everything would entice more people to try whatever brand of security software... many people are leery of risk-free trials, because there's most always a catch, making them not risk-free at all. Anyway, just a thought. A thought for Andrei from Heimdal, who's been both professional & kind enough to answer questions & comments today... Heimdal is not AV software, so this may be irrelevant, but has Heimdal Security thought about providing a removal app, similar to what some AV companies offer for their products? I know you have something here, but I'm referring to small specialized apps that remove all traces: heimdal[.]zendesk[. ]com/hc/en-us/articles/207689335-How-to-uninstall-Heimdal-CORP-silently- Many people are not aware such programs exist, & I've rarely seen them mentioned outside of support docs, but I've always thought that knowing they could easily remove everything would entice more people to try whatever brand of security software... many people are leery of risk-free trials, because there's most always a catch, making them not risk-free at all. Anyway, just a thought. Thanks for your suggestion, I'll take this up internally, if it's not already on the roadmap for development. mike, Thanks for your suggestion, I'll take this up internally, if it's not already on the roadmap for development. Glad I saw the 6 month limitation. Not acceptable. Didn't install on other 22 machines. As I have said here in the past, I received Acrobat 5 & 6 gratis--full unlimited licenses. As a result I bought Acrobat 7, 8, 9, 10 & 11, product & licenses. (Acrobat has since become bloated with a clumsy illogical user interface; needs a complete re-writing.) Some versions multiple times, some only twice. But two unlimited freebies resulted in more than 15 purchases. If your product won't sell itself, then why bother to offer it? If it isn't useful enough that any user will want it, why bother to write in the first place? There's a lot of useless "security" ware out there. If Heimdal is worth having, why is the company not willing to stand behind it with full versions? If people aren't talking about it, no amount advertising will make a sales difference. Direct advertising is no longer effective. I have this product on the machine I am using--works intermittently. It is hard to tell since there is no noticeable interaction--just skype that opens occasionally (I don't use any Microsoft crap except as absolutely necessary). Its interface doesn't add to usefulness or understanding. Today Heimdal cannot connect to the company server. Does not show up in the start menu. It may be a great product but the company's approach is out of whack. That prevents a full understanding of its value. I won't recommend a six month free license for any software. If Heimdal had given a free lifetime license from the site I got the one that I am using, there's a good chance the other 22 machines would get the software (22 purchases). That doesn't count the 6 Apples . . . no vision. Would it be fair to people that actually buy full licenses if we were to give them away for free? I would feel somewhat deceived if I bought a $44 1-year license and the next day saw a giveaway offering such a license for free. Anyway, thanks for your comment, your suggestion was noted. DoktorThomas™, Would it be fair to people that actually buy full licenses if we were to give them away for free? I would feel somewhat deceived if I bought a $44 1-year license and the next day saw a giveaway offering such a license for free. Anyway, thanks for your comment, your suggestion was noted. DoktorThomas™, 22 installs isn't trying out software. That is expecting commercial software to be given away for free. Bozos in charge indeed. Andrei from Heimdal Security, In free market econimies there is always the risk after buying now at todays price that tomorrow there might be a special offer on or even something is given away as a loss leader... It's normal! The proper justification for not being able to offer a lifetime license in this instance is that the protection is server/cloud based and that has to be financed through ongoing subscriptions. But that does not excuse the 6 month license duration which is presented as a buyable option but it is not offered on your website, Minimum term offered is 1 year with 1 pc, no mention of 6 month licensing that I can see! Andrei from Heimdal Security, In free market econimies there is always the risk after buying now at todays price that tomorrow there might be a special offer on or even something is given away as a loss leader... It's normal! The proper justification for not being able to offer a lifetime license in this instance is that the protection is server/cloud based and that has to be financed through ongoing subscriptions. But that does not excuse the 6 month license duration which is presented as a buyable option but it is not offered on your website, Minimum term offered is 1 year with 1 pc, no mention of 6 month licensing that I can see! Willam Johnson, I think DT is implying if the terms were reasonable on the giveaway he'd be inclined to exercise his professional influence over the admin of 22 other machines at work to get the product purchassed and installed on those 22 machines. Of course I could be wrong but that's how I read his comment. DoktorThomas,: What an unreasonable comment! You are a non-customer, telling them how to get more non-customers! SMH. DoktorThomas said that he would have purchased this software for all 22 computers. He didn't say that he would have installed it for free on every computer. Willam Johnson, DoktorThomas said that he would have purchased this software for all 22 computers. He didn't say that he would have installed it for free on every computer. DoktorThomas™, Why is 6 months not long enough for you to evaluate it's features in order to make a decision to purchase? If Microsoft were such bozos then most of the planet would not be running Windows and would prefer the already long available alternative, Linux. DoktorThomas™, Why is 6 months not long enough for you to evaluate it's features in order to make a decision to purchase? If Microsoft were such bozos then most of the planet would not be running Windows and would prefer the already long available alternative, Linux. DoktorThomas™, Lol I in no way can back you on your comment as it is so greedy that it makes me laugh. These programs on GOTD are for people to try and decide if it's good or bad and if you should purchase it. Not for 20 or more computers at work and I don't believe that any of the programs given away here are for any company to implement on their working computers. They offer their programs for the normal person to try and evaluate and give feed back on how it worked or any bugs that need looking at or any suggestions to make it better. But hey it is what it is and I guess if a person wants to put it on all the business computers then it isn't against the law or anything but I think that to me would be an abuse of a free offering and maybe that's why companies are only offering 6 moth and 1 year licenses because they lose a ton of money that is well deserved. DoktorThomas™, Lol I in no way can back you on your comment as it is so greedy that it makes me laugh. These programs on GOTD are for people to try and decide if it's good or bad and if you should purchase it. Not for 20 or more computers at work and I don't believe that any of the programs given away here are for any company to implement on their working computers. They offer their programs for the normal person to try and evaluate and give feed back on how it worked or any bugs that need looking at or any suggestions to make it better. But hey it is what it is and I guess if a person wants to put it on all the business computers then it isn't against the law or anything but I think that to me would be an abuse of a free offering and maybe that's why companies are only offering 6 moth and 1 year licenses because they lose a ton of money that is well deserved. JMO !! Odd installation process - once you d/l the zip file, there are 2 files within: the setup and readme. You must follow the URL in the readme in order to get the activation code for the Pro version and from there the d/l process begins. If you just run the setup file in the zip GOTD d/l, you get the freeware basic version. Once installed, it is basically a software updater - it will scan software installed AND, most importantly, software that you had uninstalled looking for updates. Example: I uninstalled Adobe Reader months ago and replaced it with Foxit Reader. Heimdal PRO gave me the option of installing Adobe Reader. Not good - I don't like Adobe software. Other examples are 32 bit versions of software I already have installed. If I have 64 bit, why would I want to install a 32 bit along with it? The installation process is GOTD's. If you were to buy the product from our website, you just have to make the payment and then get the license key & link to download installer via email & onsite. The software updating feature will show you a list of software, from which you can select the ones you want to install or keep up-to-date through Heimdal. It will install only the apps you select, and same goes for updating. Regarding the comparison to AVs, please note that Heimdal doesn't work that way. Heimdal doesn't only look at your browser's traffic, but all internet traffic that's communicating with your PC - think of the ads that are displayed in Skype. They're a great way for cyber criminal to open back doors to your computer and deliver malware. Heimdal will block that communication, AVs will only look at the websites you open in your browser. No security software will ever offer you full protection, and who claims otherwise is deceiving you. That's why we recommend multi-layered protection, and Heimdal is an addition to AV protection. BillyB, The installation process is GOTD's. If you were to buy the product from our website, you just have to make the payment and then get the license key & link to download installer via email & onsite. The software updating feature will show you a list of software, from which you can select the ones you want to install or keep up-to-date through Heimdal. It will install only the apps you select, and same goes for updating. Regarding the comparison to AVs, please note that Heimdal doesn't work that way. Heimdal doesn't only look at your browser's traffic, but all internet traffic that's communicating with your PC - think of the ads that are displayed in Skype. They're a great way for cyber criminal to open back doors to your computer and deliver malware. Heimdal will block that communication, AVs will only look at the websites you open in your browser. No security software will ever offer you full protection, and who claims otherwise is deceiving you. That's why we recommend multi-layered protection, and Heimdal is an addition to AV protection. Hope this helps. Hi, thank you for being here and helping us to solve problems with downloading and registration. Downloadid last time on GOTD, did work well, but has gone to free version a time ago. Is it possible to update to Pro version without problems now. And to register (22 dollar) is that for lifetime, a year, or what? Hi, thank you for being here and helping us to solve problems with downloading and registration. Downloadid last time on GOTD, did work well, but has gone to free version a time ago. Is it possible to update to Pro version without problems now. And to register (22 dollar) is that for lifetime, a year, or what? Kjell, the retail price for our product is actually $44 / year, and $22 is just calculated to put a price on the 6-month licenses we're offering through this giveaway. If you already have the FREE version installed, you don't need to reinstall it now. Just get your free key and use it in the Heimdal FREE you already have installed on your PC. Kjell, the retail price for our product is actually $44 / year, and $22 is just calculated to put a price on the 6-month licenses we're offering through this giveaway. If you already have the FREE version installed, you don't need to reinstall it now. Just get your free key and use it in the Heimdal FREE you already have installed on your PC. What programs does Heimdal it update, just security ones or any program. Joe, It updates itself with the latest virus list. ... only Chrome is of use to me, and it auto-updates itself, so Heimdal Pro's value is really unclear to me. Andrei from Heimdal Security, This seems a bit light. I trialed Pro before and was surprised at how few programs it monitored... From your list above: • Adobe Acrobat Reader - Not on my machines • Adobe Flash Plugin - Not on my machines • Adobe Air - Not on my machines • Chrome - YES! • Firefox - Not on my machines • VLC - Not on my machines • Microsoft Silverlight - Not on my machines • QuickTime - Not on my machines • Skype - Not on my machines • Thunderbird - Not on my machines ... only Chrome is of use to me, and it auto-updates itself, so Heimdal Pro's value is really unclear to me. ' What am I overlooking? Injeun, Oops! Sorry Joe. I guess it does update some software. Downloaded, installed and registered without a problem on a Win 7 64bit machine. License shows Pro-Version valid for 183 days. Is there any difference between six months full trial and six month license? Luis, we don't offer trials. The license obtained through this giveaway is full. I tried many times. When I want to install it it tells me the specified account already exists. Fred Mac Donald, do you get that message on our website during registration or when trying to activate the product? Could you please send this info & a screenshot to my Support colleagues at support@heimdalsecurity.com? krypteller, Heimdal needs to communicate with our servers, of course. It doesn't have a local database like antivirus products do. That's why it takes so little space on your PC. And, in the same way, if you'll block it from communicating with our servers, the full version will not be activated - the key validation does not happen locally, on the machine. krypteller, Heimdal needs to communicate with our servers, of course. It doesn't have a local database like antivirus products do. That's why it takes so little space on your PC. And, in the same way, if you'll block it from communicating with our servers, the full version will not be activated - the key validation does not happen locally, on the machine. krypteller, Heimdal is DNS-based, so it will change your local DNS to analyze your internet traffic through a bloom filter - if SandboxIE is not allowing it to change DNS, you will get that error. Andrei from Heimdal Security, so part of the protection offered is DNS filtering similar to what OpenDNS offer and what can be provided locally in "hosts" file DNS overriding standard DNS servers blocking the various malicious domains using the trusted known lists out there? Tried the link for the license, it's timing out. Same issue as noted in the comments earlier. fasstdak, the issue has been solved as I see, so please give it another try. :) Thanks! I got my license key and put it into registering the software, it excepted it, but when I rebooted, it comes up that I only have the free version. I tried to put license in again and it will not except it. Mykle, that shouldn't happen - could you please send an email with your issue to support@heimdalsecurity.com? This giveaway software is supposed to be for security. Heimdal Pro 2.2.0 is supposed to keep you safe from 2nd generation malware. Do you know what happens when you click on the URL link (provided at top of this GOTD page) to the software's home page? You have to wait a while. In the mean time your PC is redirected or connected to a long series of other places. Eventually, you are led to Heimdal home page. They flash very fast. One of them is "marketing..." something. One of those is reported in my PC as "Sending request to ib.adnxs.com" which is well known as a pop up malware. Irony of an anti-malware software, first leading you to a malware before you can access their webpage. Go ahead, all of you GOTD users. Test it out on your PC and watch the bottom left corner of your screen as the status reports of the connection process flashes. Prove to yourself that this is true. This giveaway software is supposed to be for security. Heimdal Pro 2.2.0 is supposed to keep you safe from 2nd generation malware. Quote <i>"ransomware, financial malware, and other advanced threats that antivirus can’t block. With its powerful traffic filtering engine, its advanced malware engine and its automatic and silent software updating engine, Heimdal PRO keeps users safe from the latest cyber threats." </i> UnQuote Do you know what happens when you click on the URL link (provided at top of this GOTD page) to the software's home page? 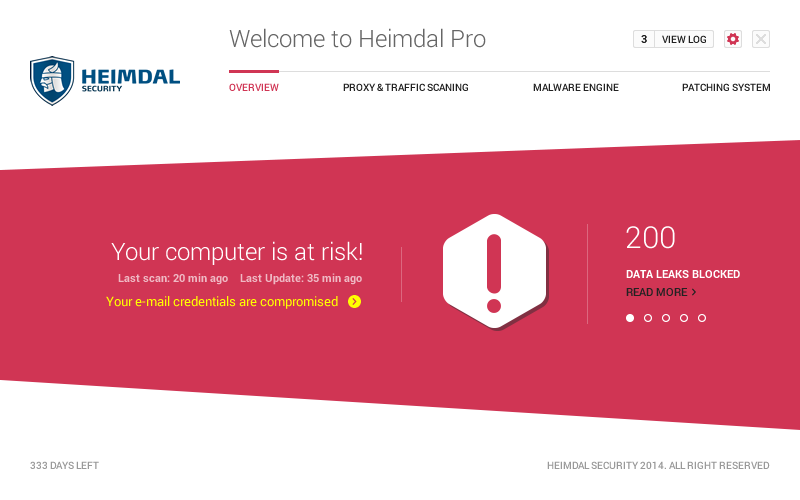 Homepage: https://heimdalsecurity.com/en/products/heimdal-pro You have to wait a while. In the mean time your PC is redirected or connected to a long series of other places. Eventually, you are led to Heimdal home page. They flash very fast. One of them is "marketing..." something. One of those is reported in my PC as "Sending request to ib.adnxs.com" which is well known as a pop up malware. Irony of an anti-malware software, first leading you to a malware before you can access their webpage. Go ahead, all of you GOTD users. Test it out on your PC and watch the bottom left corner of your screen as the status reports of the connection process flashes. Prove to yourself that this is true. I'm not aware of what GOTD put behind that link on their site, but if you go to our website by typing it directly into your browsers, or go via Google, I can assure you it's clean. You can also use virustotal.com - choose the URL tab, type in "heimdalsecurity.com" (not the link from GOTD) and you'll see its detection rate is 0 / 67.
ricohflex, You can also use virustotal.com - choose the URL tab, type in "heimdalsecurity.com" (not the link from GOTD) and you'll see its detection rate is 0 / 67. Checked the Heimdal page, checked the links, no "malware" found. B.t.w. there is a difference between malware and tracking scripts, like google analytics and others (I did found some tracking scripts on the Heimdal page, nothing special though; GOTD and almost every major manufacturers website use some form of those). If you keep seeing messages you don´t trust, try scanning your computer with Mbam or equal if you don´t trust Heimdal. It might be something on your computer. Checked the Heimdal page, checked the links, no "malware" found. B.t.w. there is a difference between malware and tracking scripts, like google analytics and others (I did found some tracking scripts on the Heimdal page, nothing special though; GOTD and almost every major manufacturers website use some form of those). If you keep seeing messages you don´t trust, try scanning your computer with Mbam or equal if you don´t trust Heimdal. It might be something on your computer. ricohflex, I'd be concerend if you are experiencing what you say as the link provided by GAOTD is direct to their domain and no redirect to anywhere else. On the link you provided there is of course the redirect via sur.ly but official webpage link with heading above it called "Homepage:" is direct and free from any manipulation on a clean PC! "Unfortunately, there was an issue with your request. The license was not created." Impossible to get the licence key "Unfortunately, there was an issue with your request. The license was not created." DAVID , our development team is working on fixing the issue in our online shop. Sorry for the inconvenience. Thanks for sending me the key via email, I am now using the program. I would have loved to activate the software (I am from Switzerland) but like David and others there is a problem. I did try one last time before leaving for the day. John J. Pepper, Great, thanks for letting us know. Have a nice weekend, too! John J. Pepper, the issue has been solved as I see, so please give it another try. :) Thanks! What's Up! "Unfortunately, there was an issue with your request. The license was not created." Jarda025, it seems that some users are getting that error, while others have no problem in getting the license. We're currently looking into this problem. Sorry for the inconvenience. and you will understand it is an innocent toolbox, written by Microsoft to save programmers time and us money. Ninite is one of the few sites where you can download clean freeware software. If you do noet know what .NET is, read http://www.howtogeek.com/253588/what-is-the-microsoft-net-framework-and-why-is-it-installed-on-my-pc/ and you will understand it is an innocent toolbox, written by Microsoft to save programmers time and us money. The savest place to get your .NET 4.6.1 is at Ninite: https://ninite.com/.net4.6.1/ Ninite is one of the few sites where you can download clean freeware software. There's no need for that. When installing Heimdal PRO, it will look for .NET Framework in your computer and if it's not there, it will automatically download & install it. krypteller, Thanks for your comment. There's no need for that. When installing Heimdal PRO, it will look for .NET Framework in your computer and if it's not there, it will automatically download & install it. Andrei from Heimdal Security, but Ninite is handy for clean updates! I know it's useful, but Heimdal is fully automated - you just select from the beginning what apps you need to keep up-to-date, and it will do that continuously. krypteller, I know it's useful, but Heimdal is fully automated - you just select from the beginning what apps you need to keep up-to-date, and it will do that continuously. Concerning NET Framework 4 and beyond...always a pain & always updating for security leaks, but needed for some programs to run. Depends on how bad you want those programs. I prefer not...LOL. The giveaway version, as I understand from Andrei's comments, appears to be a software updater like Secunia or Hippo with security scans added, and the security functions will stop after six months leaving only an automatic updater. I haven't checked reviews to see if it's as good an updater as Secunia and Hippo and Ninite, but I see a problem for GOTD fans with any program that automatically updates or upgrades our software since most giveaways will be annulled by upgrading and cease to work. If Heimdal overrides the "Do not check for updates" setting, we could be thoroughly screwed! The giveaway version, as I understand from Andrei's comments, appears to be a software updater like Secunia or Hippo with security scans added, and the security functions will stop after six months leaving only an automatic updater. I haven't checked reviews to see if it's as good an updater as Secunia and Hippo and Ninite, but I see a problem for GOTD fans with any program that automatically updates or upgrades our software since most giveaways will be annulled by upgrading and cease to work. If Heimdal overrides the "Do not check for updates" setting, we could be thoroughly screwed! 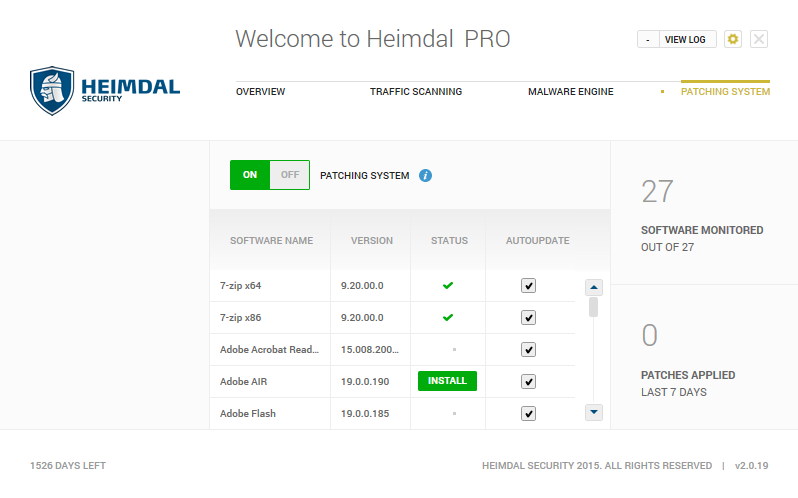 Heimdal PRO automatically updates security-critical software like Adobe Shockwave, Adobe Acrobat Reader, Adobe Flash Plugin, Adobe Air, Chrome, Firefox, VLC, Microsoft Silverlight, QuickTime, Skype, Thunderbird, etc. These are apps exploited by cyber criminals, and used to open back doors into users' computers. It will not auto-update software like the ones you get from GOTD, plus you have full-control over which apps Heimdal will update. Wayne, Heimdal PRO automatically updates security-critical software like Adobe Shockwave, Adobe Acrobat Reader, Adobe Flash Plugin, Adobe Air, Chrome, Firefox, VLC, Microsoft Silverlight, QuickTime, Skype, Thunderbird, etc. These are apps exploited by cyber criminals, and used to open back doors into users' computers. It will not auto-update software like the ones you get from GOTD, plus you have full-control over which apps Heimdal will update. Hope my comment helps. So what will happen after 6 months? After the 6-month license expires, the product will revert to the free version, which has only the automatic & silent software updating engine active. You will be able to re-activate the PRO version at any time, by inserting a valid license key. ladygaga, After the 6-month license expires, the product will revert to the free version, which has only the automatic & silent software updating engine active. You will be able to re-activate the PRO version at any time, by inserting a valid license key. Hope this helps! I meant entering a new one, because 6 months from now, the key obtained through this giveaway will not be valid anymore. gman, I meant entering a new one, because 6 months from now, the key obtained through this giveaway will not be valid anymore. Unfortunately, there was an issue with your request. The license was not created. Unfortunately, there was an issue with your request. The license was not created. Mike Guan, we're working on solving the issue. Please try again a bit later. Thanks for understanding! Mike Guan, the issue has been solved as I see, so please give it another try. Thanks! A quick and easy download and activation (after NET Framework 4 installation). On opening the UGI is very clean and uncluttered. However, I can't see any option to do a manual scan and Traffic Filter when turned on, turns itself off after a few seconds, don't know if this because of restrictions imposed by developer because it's a giveaway, or what. Perhaps the developer could clarify this for us. Otherwise its too early to say if it does what it claims, needs further testing. You have the option of doing a manual scan by hovering over the tick symbol in the Overview tab - it will turn to "SCAN" when your cursor is over it. Regarding the Traffic Filtering engine going off - no, that's not a limitation due to the giveaway, the product is full. Heimdal PRO is DNS-based and might interfere with another DNS-based software on your computer - just to be sure, please send an email to support@heimdalsecurity.com, so that my colleagues from Support can check it out. Despite the note in the Readme file posted by GOTD, we do offer free technical support & updated during the license period. Andrei from Heimdal Security, Thanks very much for your reply, I've managed to figure out the Traffic Filtering issue after messing about for a bit. Nice to see the developers, taking the time to answer queries, does a lot to inspire confidence in their products. Have a good day. Applying for registration at Heimdal site using link provided in the download fails to work. Elvy, we're working on solving the issue. Please try again a bit later. Thanks for understanding! Elvy, the issue with licensing has been solved, so please give it another try. I like Heimdal Pro,both the way they answered questions last time they offered the software here on GOTD and the program itself. I think it works well to my knowledge. Not often, but from time to time there is a popup that tells me they stopped threats. Kjell, that program needs that for good working. Will install full NET Framework 4. Diana, what is NET Framework 4, and what does it to your PC? Diana, no, it was not,I am a novice to this,but I found out. @Lenny: Don´t harm? It took away 2 GB (64bit-system) for nothing - no other SW on my system need it - so why should I install it only for these? Also I don´t need a tool that automatically update my programs - what these tool makes. Kjell, sorry I thought so because your later comment suggest that you use these SW for some time... @Lenny: Don´t harm? It took away 2 GB (64bit-system) for nothing - no other SW on my system need it - so why should I install it only for these? Also I don´t need a tool that automatically update my programs - what these tool makes. 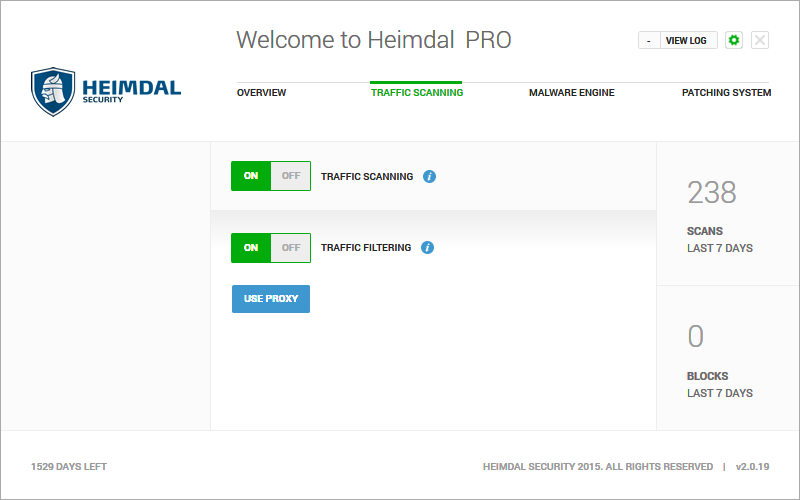 You can see more details about Heimdal PRO on our website: https://heimdalsecurity.com/en/products/heimdal-pro. 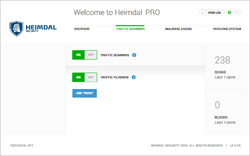 Diana, You can see more details about Heimdal PRO on our website: https://heimdalsecurity.com/en/products/heimdal-pro. Thanks! Andrei from Heimdal Security, found it - the mistake is the "." at the end of the link.